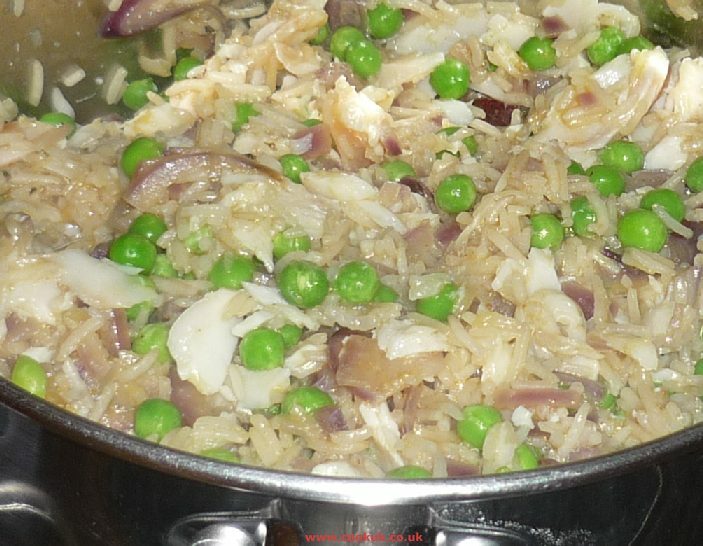 Kedgeree is essentially an Indian dish but its roots are not that simple. It is believed that when the British ruled India they included fish in an already Indian recipe and the result was kedgeree. The Fish - the traditional fish to use is smoked haddock, and the white undyed one. But in fact many fishes can be used such as cod, salmon or coley. Some recipes even suggest using tinned salmon but that really doesn't give good results. The Rice - Basmati rice works best but any long grain rice is OK. Whichever rice you use be sure to remove the starch from it before cooking. If the starch is not removed the rice will stick together and form a sticky mass. To remove the starch, rinse the rice in four lots of water. Then leave the rice to stand in a large bowl of water for 15 minutes (longer if you the time) and give it one more final rinse. The Eggs - free range is best. Then comes the question of how long they are cooked to hard boil them. Some like the yolks still gooey, others prefer the more traditional firm hard boiled egg, as we do. Reduce the boiling time in the recipe below to suit your taste. Curry Paste - this livens up the kedgeree but don't go overboard on the curry paste. Use a little and let the flavour of the other ingredients shine through as well. Parsley - use fresh chopped parsley and not the dried stuff. And use lots of parsley, it is a key ingredient of kedgeree. Large pan with a well fitting lid. Boil the eggs for 10 minutes (less if you prefer soft yolks), remove the shells and cut into small chunks. If using frozen peas, remove them from the freezer now to defrost. Place the haddock in a largish flat bottomed bowl and pour on 400ml / just under ¾ pint of boiling water. Leave the haddock to part cook for 5 minutes. Remove the haddock from the water and keep all the water for later use. 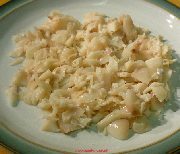 Remove the skin from the haddock and break the flesh into flakes. Discard any bones you come across. Place the haddock to one side. Add the olive oil to the pan on a medium heat and add the chopped onions. Fry the onions for about 5 minutes until they are softened but not browned. Add the rice and the curry paste to the pan and cook for three minutes stirring well. Pour in the water (saved from the previous step) into the pan and bring to the boil. Turn the heat down to its lowest heat and cover the pan with the well-fitting lid. Leave the pan for 8 minutes. The idea is for the rice to absorb almost all the water. Take off the lid to add the flaked haddock and the peas. Stir them in then place the lid back on. Let it cook, still on the lowest heat, for 5 minutes or so until the rice has absorbed almost all the water. 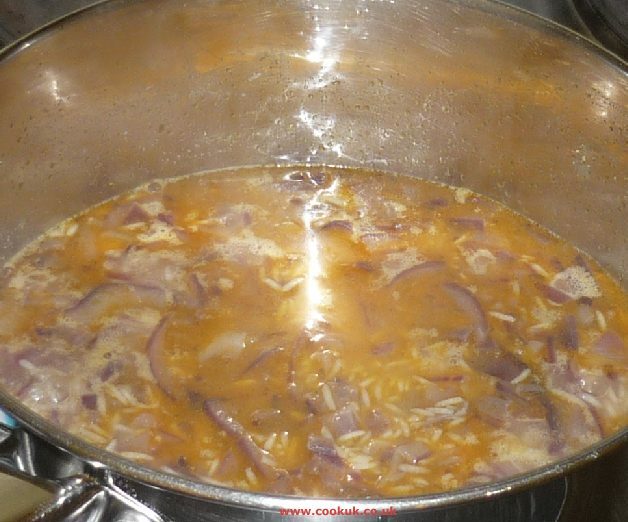 If the liquid is absorbed before the five minutes of cooking then add a couple of tablespoons more of water. This will stop the rice sticking to the bottom of the pan. Chop the butter into small pieces and spread them over the kedgeree. Remove the pan from the heat, replace the lid and let it stand for 4 more minutes. Finely chop the parsley and ad it to the kedgeree with the eggs. Mix them in well but do it gently. Taste and add salt and pepper to taste. Chop the lemon into wedges and serve the kedgeree onto warm plates with a wedge or two of lemon per plate. Sprinkle a little of the cayenne pepper over each serving. This is quite delicious and my children want it for breakfast on Christmas morning. MY MUM MADE KEDGEREE FOR ME WHEN I WAS A LITTLE GIRL. SHE'S NINETY NOW AND IT STILL TASTES LOVELY. 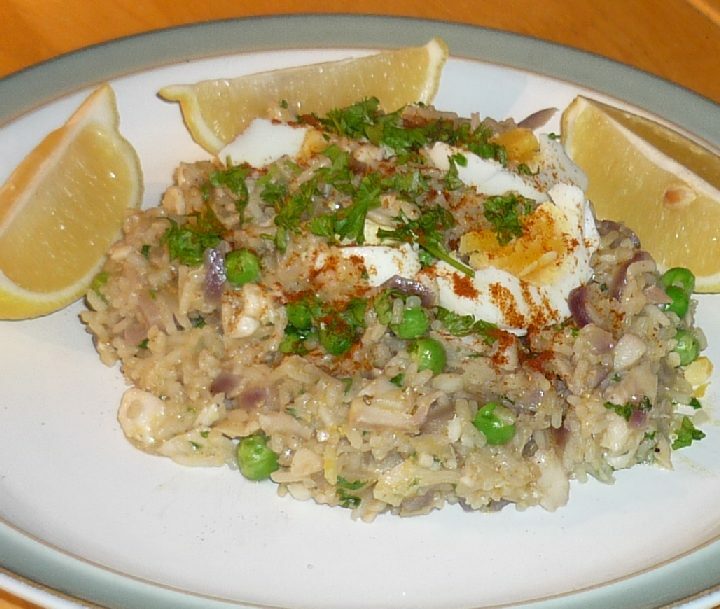 Kedgeree is a Scottish dish, the same as chicken tikka masala. Trying this kedgeree recipe for tea tonight, haven't had this since I was a kid. Hope they all love it as much as I do. I agree with Tim. Definitely a Scottish dish. I make it quickly with tuna and curry powder. Will try this recipe though. THANK U FOR HAVING SUCH A NICE IDEA, I REALLY ENJOY IT. That's wrong, it is a Scottish dish, that was introduced to India by Scottish troops during the British Raj. Its roots can be traced back to the 1700's in Scotland, I think the National Trust proved it some years ago. It is a great dish though that's for sure. 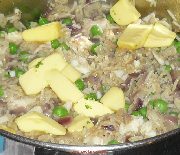 I have made kedgeree for years but never made it with curry or any hot spices, just yellow fish, boiled rice , boiled eggs ,seasoning and when cooked add a knob of butter and serve. Just perfect. I made kedgeree with smoked cod, curry powder and turmeric. Boiled rice and eggs. Don't forget the onions and butter. Kids love it. Like the look of your recipe. A little dollop of horse radish sauce on the side makes this delicious dish even deliciouser. Made this tonight and the whole family really enjoyed it. Kids 4 yrs and 20 months old, so I went easy on the curry paste & cayenne and seasoned our adult serving with more cayenne & salt on the plate. Delicious thanks! ADD YOUR COMMENTS BELOW ABOUT THIS KEDGEREE RECIPE. IT WILL BE ADDED ABOVE WITHIN 12 HOURS.